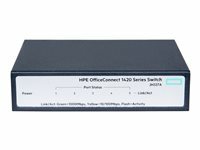 The HPE OfficeConnect 1420 Switch Series delivers cost effective gigabit Ethernet (1GbE) connectivity offering small businesses 10 times the performance of Fast Ethernet with unmanaged plug-and-play simplicity. The series includes models with gigabit performance and a choice of key features including PoE+ for powering IP devices, Fibre and 10G uplinks for connectivity to servers and storage. Green features for low power consumption Fan-less design for silent operation Quality-of-service (QoS) support PoE+ for powering IP devices Future-proof 10G for high-speed fibre connection to servers or switches, using optional SFP+ or SFP transceivers. Lifetime warranty Available in 5,8,16 and 24 port versions. The HPE OfficeConnect 1420-5G-PoE+ Switch delivers cost effective gigabit Ethernet (1GbE) connectivity offering small businesses 10 times the performance of Fast Ethernet with unmanaged plug-and-play simplicity. The 1420-5G-PoE+ includes PoE+ for powering IP devices. Supports silent fanless operation, automated features for hands off operation and low power consumption and comes with limited lifetime warranty and 24X7 phone support for 90 days. HPE OfficeConnect 1420 switches have quality of service (QoS) support and IEEE 802.3x flow control features that improve network efficiency. Simplified plug-and-play convenience is supported by features such as auto-MDIX and auto-speed negotiation. Hewlett Packard Enterprise has innovated and combined the latest advances in silicon technology to bring you some of the most power-efficient switches. All models support the Energy Efficient Ethernet IEEE 802.3az standard, as well as auto power-down mode on idle ports and power saving on short-distance cables. Offers compact solution for PoE customers. Cost-effective, High-performance GbE Layer 2 Switching The HPE OfficeConnect 1420 Switch features gigabit Ethernet (1GbE) connectivity offering small businesses 10 times the performance of Fast Ethernet with unmanaged plug-and-play simplicity. Automated Features for Hands-off Operation The HPE OfficeConnect 1420 Switch is plug-and-play with zero configuration and no required ongoing administration. 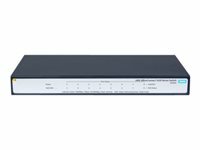 The OfficeConnect 1420 Switch supports jumbo packets to improve the performance of large data transfers. Cost-effective Ownership for Now and into the Future The 1420-5G-PoE+ includes PoE+ to power IP devices without the cost of additional cabling for power. 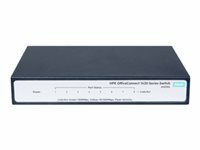 The HPE OfficeConnect 1420 8G JH329A is an 8 Port Gigabit Unmanaged Switch that delivers cost effective gigabit Ethernet (1GbE) connectivity offering small businesses 10 times the performance of Fast Ethernet with unmanaged plug-and-play simplicity. Featuring a silent fanless operation, automated features for hands off operation and low power consumption. They come with limited lifetime warranty and 24X7 phone support for 90 days. Unmanaged, Fanless Cost-effective, High-performance GbE Layer 2 Switching The HPE OfficeConnect 1420 8G Switch features gigabit Ethernet (1GbE) connectivity offering small businesses 10 times the performance of Fast Ethernet with unmanaged plug-and-play simplicity. Automated Features for Hands-off Operation The HPE OfficeConnect 1420 8G Switch is plug-and-play with zero configuration and no required ongoing administration. 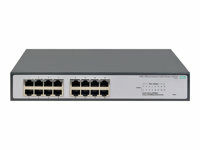 The OfficeConnect 1420 8G Switch supports jumbo packets to improve the performance of large data transfers. The HPE OfficeConnect 1420-8G-PoE+ Switch delivers cost effective gigabit Ethernet (1GbE) connectivity offering small businesses 10 times the performance of Fast Ethernet with unmanaged plug-and-play simplicity. The 1420-8G-PoE+ includes PoE+ for powering IP devices. Supports silent fanless operation, automated features for hands off operation and low power consumption and comes with limited lifetime warranty and 24X7 phone support for 90 days. Cost-effective Ownership for Now and into the Future The 1420-8G-PoE+ includes PoE+ to power IP devices without the cost of additional cabling for power. The HPE OfficeConnect 1420-16G Switch delivers cost effective gigabit Ethernet (1GbE) connectivity offering small businesses 10 times the performance of Fast Ethernet with unmanaged plug-and-play simplicity. Supports silent fanless operation, automated features for hands off operation and low power consumption and comes with limited lifetime warranty and 24X7 phone support for 90 days. 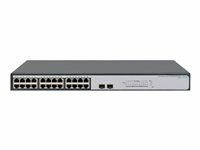 Unmanaged Gigabit switch with 16 10/100/1000 ports. Plug-and-play, requiring no setup or administration. Unmanaged, Fanless Cost-effective, High-performance GbE Layer 2 Switching The HPE OfficeConnect 1420 16G Switch features gigabit Ethernet (1GbE) connectivity offering small businesses 10 times the performance of Fast Ethernet with unmanaged plug-and-play simplicity. Automated Features for Hands-off Operation The HPE OfficeConnect 1420 16G Switch is plug-and-play with zero configuration and no required ongoing administration. The OfficeConnect 1420 16G Switch supports jumbo packets to improve the performance of large data transfers. The HPE OfficeConnect 1420-24G Switch delivers cost effective gigabit Ethernet (1GbE) connectivity offering small businesses 10 times the performance of Fast Ethernet with unmanaged plug-and-play simplicity. Supports silent fanless operation, automated features for hands off operation and low power consumption and comes with limited lifetime warranty and 24X7 phone support for 90 days. Cost-effective, High-performance GbE Layer 2 Switching The HPE OfficeConnect 1420 24G Switch features gigabit Ethernet (1GbE) connectivity offering small businesses 10 times the performance of Fast Ethernet with unmanaged plug-and-play simplicity. Automated Features for Hands-off Operation The HPE OfficeConnect 1420 24G Switch is plug-and-play with zero configuration and no required ongoing administration. The OfficeConnect 1420 24G Switch supports jumbo packets to improve the performance of large data transfers. Cost-effective, High-performance GbE Layer 2 Switching The HPE OfficeConnect 1420 24G 2SFP Switch features gigabit Ethernet (1GbE) connectivity offering small businesses 10 times the performance of Fast Ethernet with unmanaged plug-and-play simplicity. Automated Features for Hands-off Operation The HPE OfficeConnect 1420 24G 2SFP Switch is plug-and-play with zero configuration and no required ongoing administration. 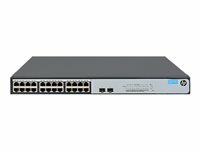 The OfficeConnect 1420 24G 2SFP Switch supports jumbo packets to improve the performance of large data transfers. Unmanaged Gigabit switch with 24 10/100/1000 ports and 2 fixed 1000/10000 SFP+ ports. Future-proof 10G for high-speed fibre connection to servers or switches, using optional SFP+ or SFP transceivers. Cost-effective, High-performance GbE Layer 2 Switching The HPE OfficeConnect 1420 24G 2SFP+ Switch features gigabit Ethernet (1GbE) connectivity offering small businesses 10 times the performance of Fast Ethernet with unmanaged plug-and-play simplicity. The 1420-24G-2SFP+ has two SFP+ uplinks where 10GbE is needed. Automated Features for Hands-off Operation The HPE OfficeConnect 1420 24G 2SFP+ Switch is plug-and-play with zero configuration and no required ongoing administration. Automated Features for Hands-off Operation The 1420-24G-PoE+ includes PoE+ to power IP devices without the cost of additional cabling for power.